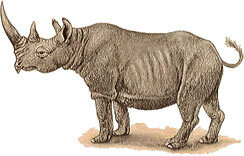 The black rhinoceros is, in fact, gray in color but varies according to the mud in which it wallows. It has no hump on its neck but has a large head, held horizontally, which bears two horns and sometimes a third small horn. Its upper lip is pointed and mobile, which helps the animal to browse on the leaves, buds, and shoots of small trees and bushes. Less sociable than the square-lipped rhinoceros, black rhinoceroses live alone, except for mothers and young. Adults live in overlapping home ranges, with boundaries marked by dung heaps. Male and female remain together for only a few days when mating. The female gives birth to a single young after a gestation of about 15 months. The young rhinoceros suckles for about a year and stays with its mother for 2 or 3 years, until her next calf is born.